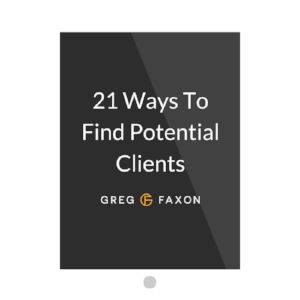 Imagine if you knew exactly what you needed to do in the next 1, 3, and 6 months to get your ideal clients to find you. What if you knew the 2-3 places to focus your energy each day instead of learning a whole bunch of stuff and randomly trying it out? Well, that's the power of reverse engineering your goals. When you reverse engineer your goals, you start with the big outcome that you want to achieve and then break it down into smaller pieces that are under your control. That way you can focus on the process and not get stressed out about short-term results. Let's get started by creating your 6 month goals. Take out a piece of paper and make a quick list of the goals you want to achieve in the next 6 months related to your coaching business. Now I want you to circle just three of those goals. Choose the ones that are most important to you. In other words, what three things would you have to see 6 months from now in order to be happy with your progress? Okay, now what I want you to do is make those three goals as specific as possible. 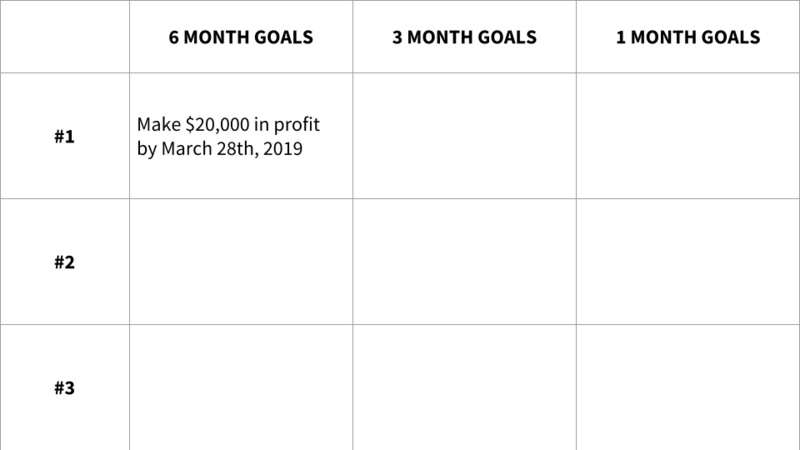 So if you wrote down "double my income" I want you to write down the exact amount of profit you want to have made by a date 6 months from now. Okay, so now you have your outcome goals. These goals are big and inspiring but they aren't 100% in your control. 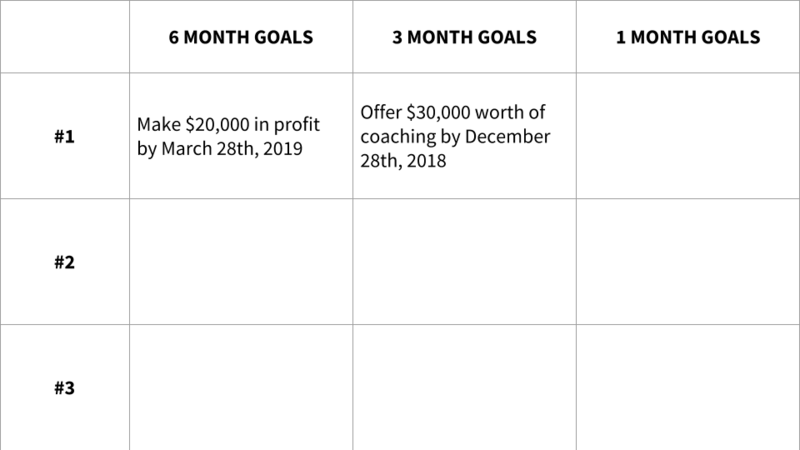 Next I want you to choose a 3 month performance goal for each of your 6 month outcome goals. Performance goals are meant to build towards your outcome goals. 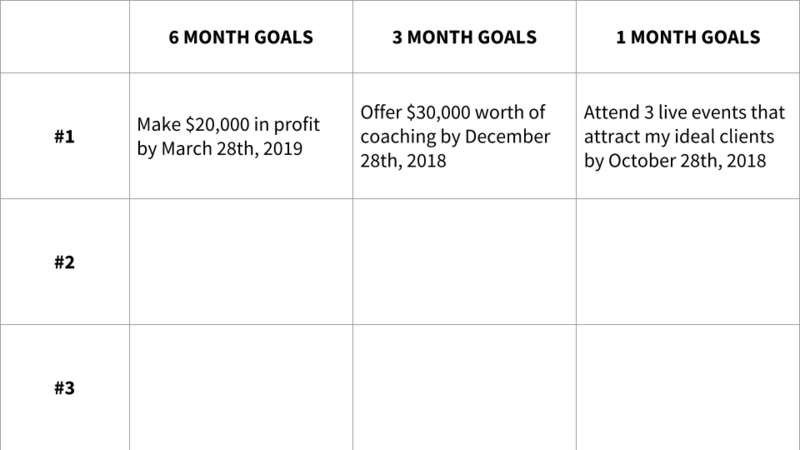 For example, if you know you want to make $20,000 in the next 6 months, and you know that you typically convert 1/3 potential clients you speak to, then your 3 month performance goal might be to offer $30,000 worth of coaching over the next three months (which you hope will result in about $10,000 of actual profit). Now, set a 3 month performance goal for each of your 6 month outcome goals. Performance goals are more directly in your control. But we can go one step further by breaking them down into 1 month process goals. To continue our income example, you might choose to focus on booking more consults with potential clients this month. Maybe you've noticed that the best way for you to do that is to attend live events that your ideal clients hang out at. So you could set a process goal to attend 3 live events that attract your ideal clients over the course of the next month. Once you're done creating three goals for each of the three periods of time (6 month, 3 months, and 1 month), you have 9 milestones that tell you exactly what to focus on each day. No more getting lost in useless tasks and wondering why you aren't getting clients.